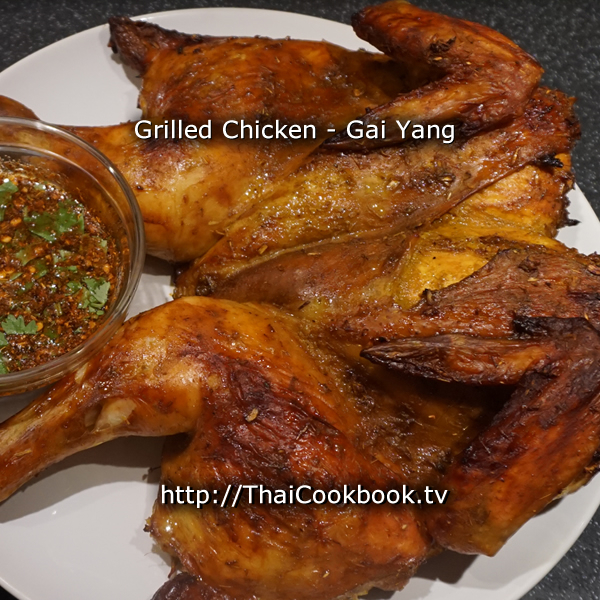 Gai Yang is a popular Thai styled barbecued chicken that can be found just about everywhere from street food vendors. The traditional way of cooking the chicken is by slowly grilling it on a wood skewer, over wood fire coals. These days you'll see the same recipe used when cooking the whole chicken on modern rotisserie ovens. 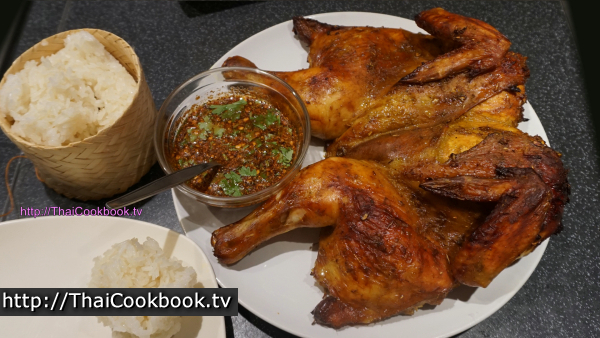 The marinade used produces a delicious and authentic tasting Thai style grilled chicken however you decide to cook it. 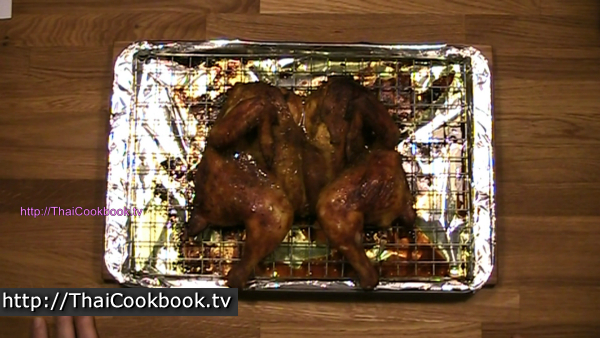 In this cooking lesson and demonstration we show you how to do it using an oven broiler. Of course it does taste different when cooked over an open fire, but the oven method is so much more convenient and we ended up with a beautiful and flavorful chicken. If you have a barbecue and want to try the traditional way, just remember to keep the heat low and cook the chicken slowly until the skin is crispy and golden brown. What's in our Grilled Chicken. How we make our Grilled Chicken. 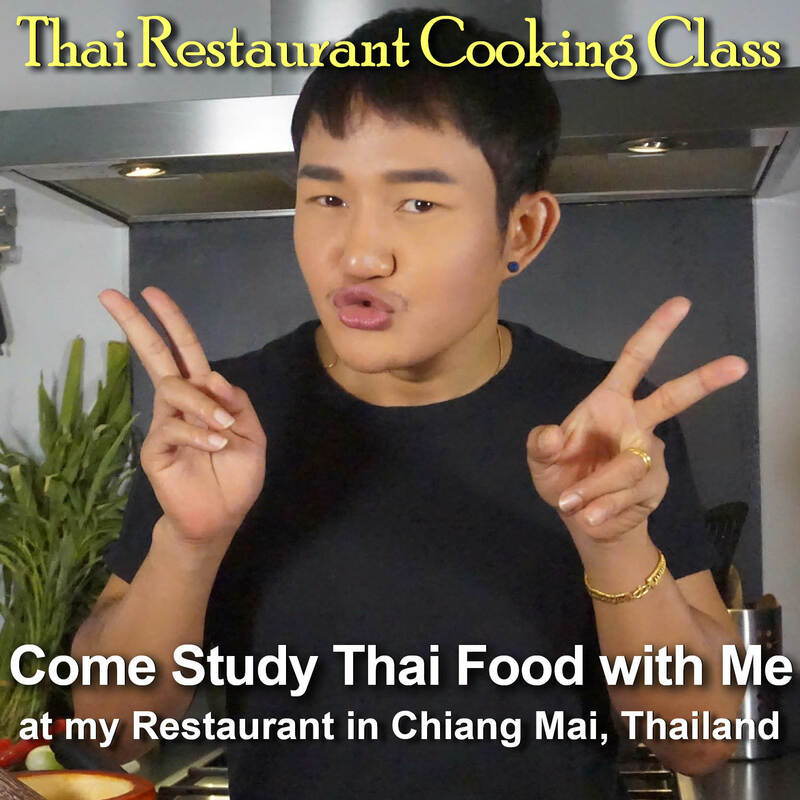 1) Prepare the marinade by grinding peppercorns, garlic, and coriander roots, then blending with soy sauce, fish sauce, dark sweet soy sauce, and turmeric powder. 2) Clean and wash the chicken. Split it down the backbone and lay flat. Marinate in the marinade for about 1 hour. 3) Broil at 175°C or 350°F for about an hour, basting a few times with the leftover marinade. 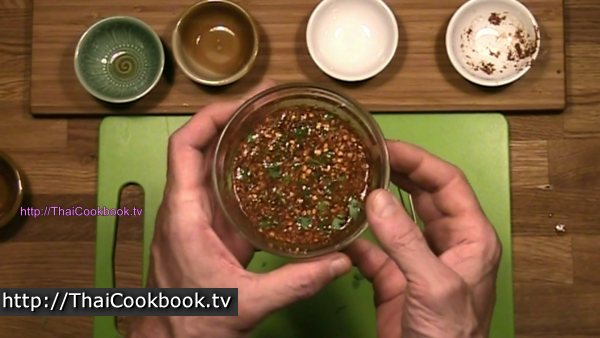 While the chicken cooks, prepare the dried chili dipping sauce. 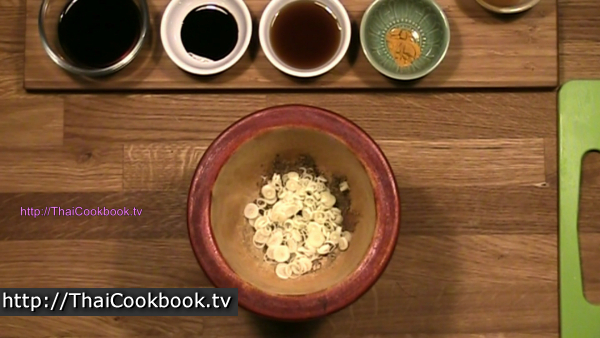 4) Serve with sticky rice, dried chili dipping sauce, and other foods. 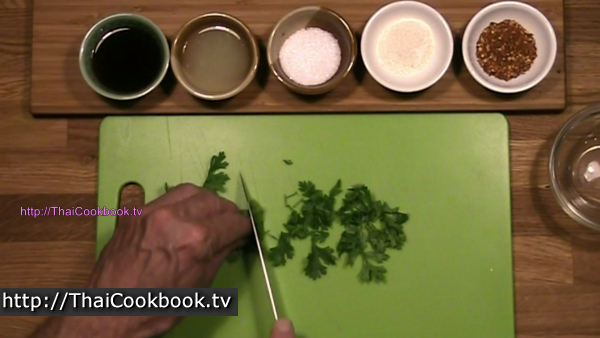 Prepare the marinade by cutting the coriander roots very small, then slicing the lemongrass very thinly. Peel the garlic cloves. Grind the peppercorns using a mortar and pestle until you have a very fine powder, then add the coriander root and garlic cloves and continue grinding. 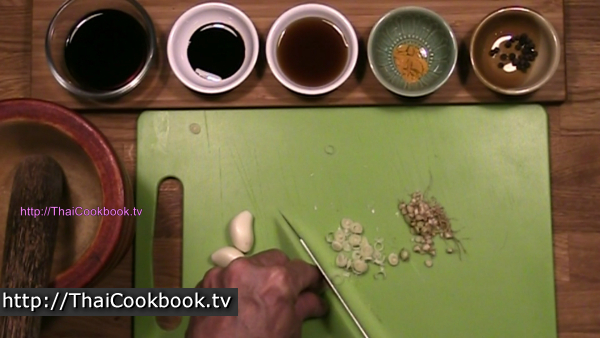 Work the garlic, coriander root, and black pepper ingredients together until you get a thick paste. 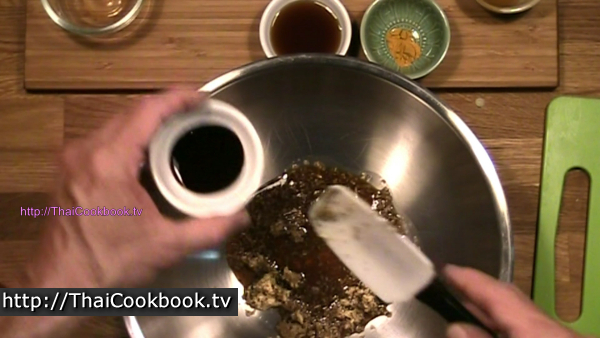 In a mixing bowl, combine the herb paste with the light soy sauce, dark sweet soy sauce, fish sauce, and turmeric powder. Stir until well blended. 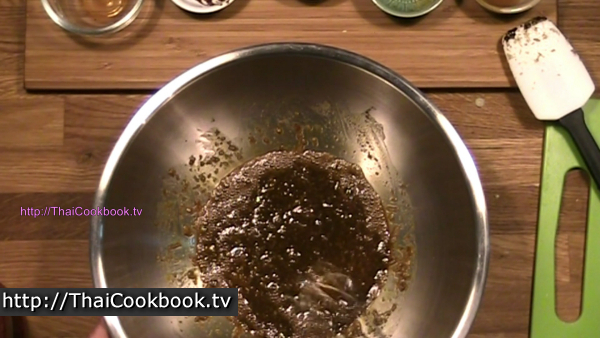 Let the marinade sit for about 15 minutes while you prepare the chicken. 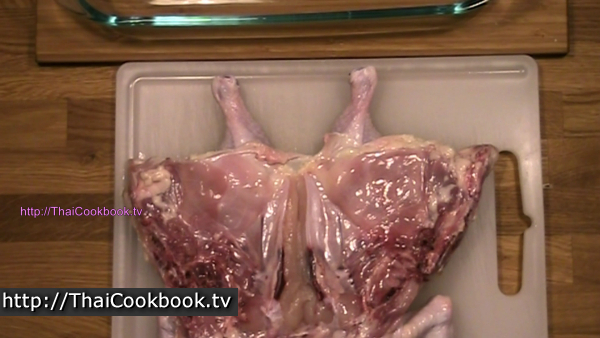 Using kitchen scissors or a very sharp knife, cut through the backbone of the chicken. Spread the chicken body out as flat as you can, then cut through the breast bone, but leaving the breast portion together so the chicken is still in one piece. Wash the body cavity out very well now under running water, then let it dry. pat dry with paper towels as needed. Place the chicken in a deep pan or baking dish, breast side up. Lift the skin on the breast away from the meat, and rub a good amount of the marinade under the skin, then lay the skin back over. Pour the rest of the marinade over the whole chicken and rub it in well. Turn the chicken breast side down and marinate for 1 hour. Preheat your oven to 175°C or 350°F with the top burner on (broiler). If you don't have a broiler, you can still do this, but it will come out better with the heat from the top. After marinating, place the chicken breast side up on a baking sheet with a wire rack. It is important to use a rack so the fat runs away from the chicken, as it would do if cooking it on a grill. Bake for 1 hour, checking from time to time. While the chicken cooks, we'll make the dipping sauce. Cut the cilantro leaves very lightly into big pieces. It should not be chopped, as you do not want to bruise it. Stir the fish sauce, lime juice, toasted ground rice, and chili flakes together. Let it stand for at least 10 minute so the rice and chili can soften up a little. Just before serving, add the cilantro and stir lightly. Baste the chicken with the remaining marinade several times while broiling so the skin gets a nice color. After about an hour, the chicken should be nice and brown. If you have a meat thermometer, the temperature of the breast should be at least 73°C or 165°F. when it's cooked. If you don't have a thermometer, then pierce the meat and make sure it is fully cooked. Remove from the broiler and let it stand for at least 15 minutes. You will often see the chicken cut up into smaller pieces and served on a big plate. I like to serve it whole at the table and let everybody cut off what they want. 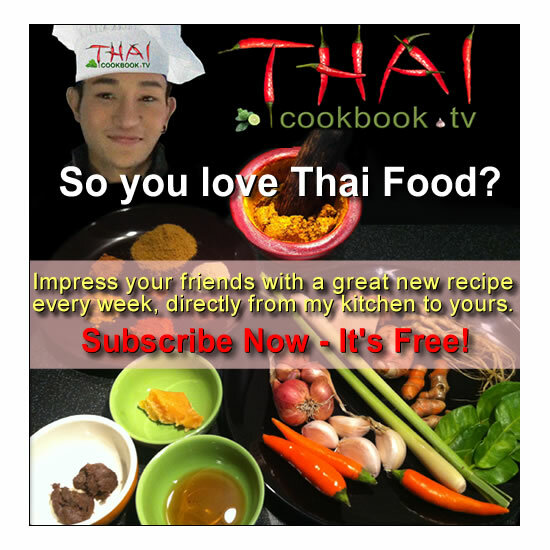 Serve with sticky rice, dried chili dipping sauce, and other foods such as Som Tum spicy papaya salad.